Course work includes medical terminology, medical insurance, accounting, healthcare finance, supervision, Microsoft Office, and oral and written communication. Additionally, you will learn to communicate effectively with patients and healthcare professionals. All course work is designed to provide a hands-on learning environment to prepare you for administrative and supervisory work in healthcare. You are given an opportunity to complete a work-based learning experience to earn real world healthcare related experience. Is the Medical Office Administration-Healthcare Administration program math intensive? Since this program prepares students for administrative and supervisory roles, there is a focus on healthcare business/administrative operations, which includes accounting and finance. So yes, there is a heavier focus on math in this program. Upon entering the program, students will need to take the math placement test to determine their entry point for learning as it relates to math and math-related courses. If the student successfully passes all parts of the math placement test, it is deemed that they have met the state level pre-requisite requirement, and can register for both a college level math (MAT-110 or MAT-143) and ACC-120. If a student requires developmental math, they must successfully complete five modules of developmental math (DMA 10-50). Developmental math is structured so that students move at their own pace, but it should be noted that progression through these five modules will take a minimum of two semesters. Successful completion of all five modules is the state level pre-requisite for both college level math (MAT-110 or MAT-143) and ACC-120. 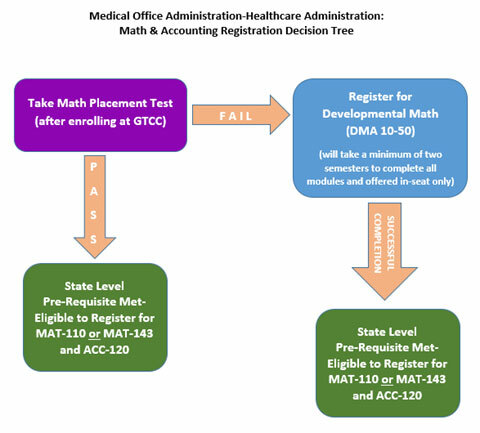 As such, once developmental math is successfully completed, students can register for both a college level math (MAT-110 or MAT-143) and ACC-120. Interested students should note that if you require developmental math, it is offered in-seat only (no online option for developmental math). Understanding these pre-requisite requirements is critical to student success and progression through the program. Students are encouraged to work closely with their assigned academic advisor to navigate the curriculum layout to move towards graduation in a timely manner. Further, students are highly encouraged to avoid delaying registration for these math/accounting courses. Can I gain employment in a supervisory or managerial role upon completing the Medical Office Administration-Healthcare Administration program? While the curriculum in the Medical Office Administration-Healthcare Administration program prepares you for supervisory or managerial roles in the healthcare field, employment opportunities will vary from person to person based on individual qualifications. Healthcare employers look at many different things when hiring for supervisory or managerial positions. They may include, but are not limited to, education level, general work experience, healthcare-specific work experience, and past supervisory or managerial experience. Students considering the Medical Office Administration-Healthcare Administration program are encouraged to research job opportunities and requirements to determine the best educational path to achieve your employment goals. This program may not be an end goal for all students, but rather, a stepping stone to the next level of education that is needed to achieve desired employment. Is the Medical Office Administration-Healthcare Administration program offered online? Yes, the Medical Office Administration-Healthcare Administration program is offered both in a traditional (in seat) and online format. Many students currently enrolled in the program work full time jobs and the online option gives them the needed flexibility to further their education while continuing to work. The only exception to this occurs if developmental math is required. Developmental math is not a program requirement, but a pre-requisite to program level courses. As noted earlier, developmental math is only offered in-seat. Yes, courses within this program will prepare you for Microsoft Office Specialist (MOS) certification. OST courses are available, in which these certification exams can be completed, or the exams can be completed through Certiport®. Please speak to your advisor for more information. The Medical Office Administration-Healthcare Administration option is NOT a limited-enrollment program, so any student interested may pursue the degree offered in the program.